Readers of my blog may remember my comments on Hélène’s entry for Wednesday 29 January 1941, when she describes how her dreadful teacher, Mr. Bourgeois, orders her friend Josette Goldstein and two others girls (Suzanne Weil and Marguerite Grumbach) to change their seats. From now on, they are to be seated at the back of the class. All three girls are Jewish, of course. Checking Hélène’s entry for this week in the war, on 17 October 1942, we read the sad news that Josette and all her family have been arrested and sent to a camp in Germany. This does not bode well for Josette and those dear to her. Many Parisian Jews had been arrested in July and confined to the Vélodrome d’Hiver prior to deportation. It was a common story for the Jews of France: arrested and sent to the concentration camp at Drancy, thence to Germany and further east to the extermination camps in Poland. Hélène’s mother (who is working for the Resistance) tells her daughter that when the war is over and she is married and she finds her diary and reads it again, she will remember how it once was, bad as well as good. 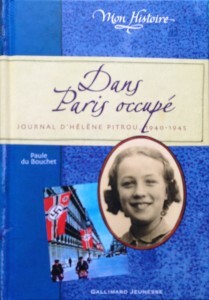 This entry was posted in World War II and tagged Dans Paris occupe, Helene Pitrou, Paule du Bouchet, Pitrou. Bookmark the permalink.